Among the cuisines of Europe, Britain’s has long been regarded as the black sheep—kippers, jellied eels, and blood pudding rarely elicit the same fond feelings as chocolate mousse or pasta primavera. Despite these unsavory stereotypes, British cuisine is anything but unremarkable today. Panikos Panayi reveals in this fascinating study that British cuisine has been transformed and enriched by diverse international influences. The last thirty years have seen immigrants flood British shores, but Spicing Up Britain reveals that foreign influences have been infusing British cuisine for the past 150 years. From the arrival of Italian ice cream vendors and German butchers in the nineteenth century to the British curry that permeates dishes today, Panayi chronicles the rich and fascinating social history behind the rise of a truly multicultural cuisine. The author argues that Britons’ eating habits have been reshaped by immigration, globalization, and increased wealth, and he explores how other cultures have woven themselves into British society through the portal of food—whether Anglo-Indian fusion dishes like chicken tikka masala, New British cuisine restaurants, or the popular home-cooked dish of spaghetti bolognese. Panayi reveals how these changes in British cuisine shed light on the role of multiculturalism in the construction of modern British identity: Britain is a diverse nation in which different peoples are united by willingness to sample the foods produced by other ethnic groups—but those ethnic groups are at the same time ghettoized by not moving beyond their own culinary traditions. 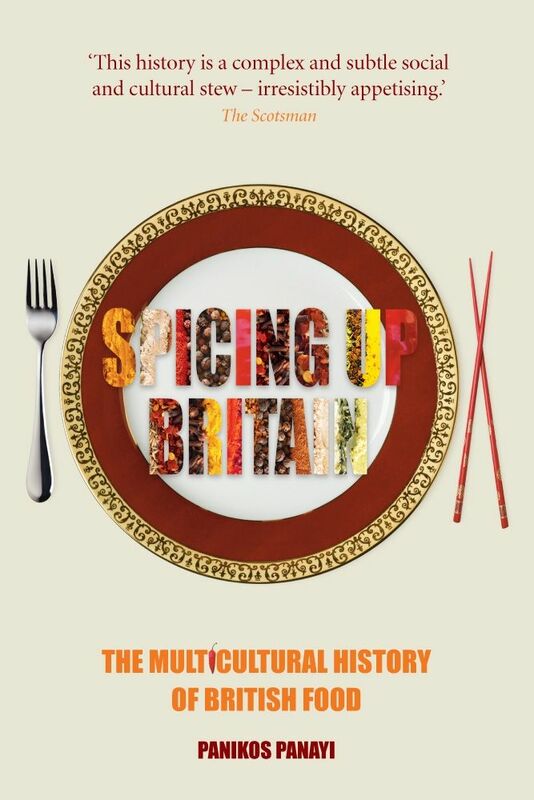 A comprehensive and engaging investigation, Spicing Up Britain serves up delicious new facets of food in Britain today. "This fills a gap between studies of British regional food and the legion of book on Anglo-Indian eating, as it has a much wider sphere of influences." "His book demonstrates convincingly that whether drawing on its former colonial and imperial possessions (including the United States, with its ever-popular hamburger and other fast foods) or on its European neighbors, the openness of British society has truly enriched its diet and produced its present-day variegated cuisine." "Next time someone fulminates about ’foreign invaders’ or ’lazy immigrants’ give them a copy of Panayi’s book. Or buy them a meal." "What makes Panayi’s book distinctive and valuable is that he demonstrates his central point by examining the diverse dimensions of Britain’s food supply and catering business over the past 150 years. . . . If Panayi has an agenda, it is to wake up ignorant Brits, to make them realise how central immigrants have been to the development of the UK’s economy and culture in the last century and a half." "Some books are researched. Others are lived. This book reflects both modalities and is strengthened by the author’s life experience and sensitivity to cultural nuance. . . . Panayi’s many examples, most of which delve deeply into the subtleties of food culture, are carefully researched, detailed, and convincing, giving the reader a taste of the dynamism of culinary interchange."